Cooking salmon on the grill can require nothing more than pre-portioned fillets, a bit of oil to grease up the grill rack, and a good spatula. With a few more additions to your grill tool chest though, you can easily elevate your game. If you are planning to grill salmon for a larger crowd, add a large grill basket (or a few smaller baskets) to your set of tools. A decent grill basket costs between $15-$30 and will come in handy for anything you want to throw on the grill that needs to be handled carefully: fish, certain veggies and fruits, things that might slip through the cracks of the grill if you’re not a careful flipper. While using a grill basket won’t get you the crispy, charred salmon skin that direct contact to a hot grill creates, you’ll be able to manage a dozen or more fillets on the fire without having to break a sweat. Just remember to grease up the basket and the grill rack beneath it to prevent any sticking. You may want to consider having cedar planks for your next cookout. 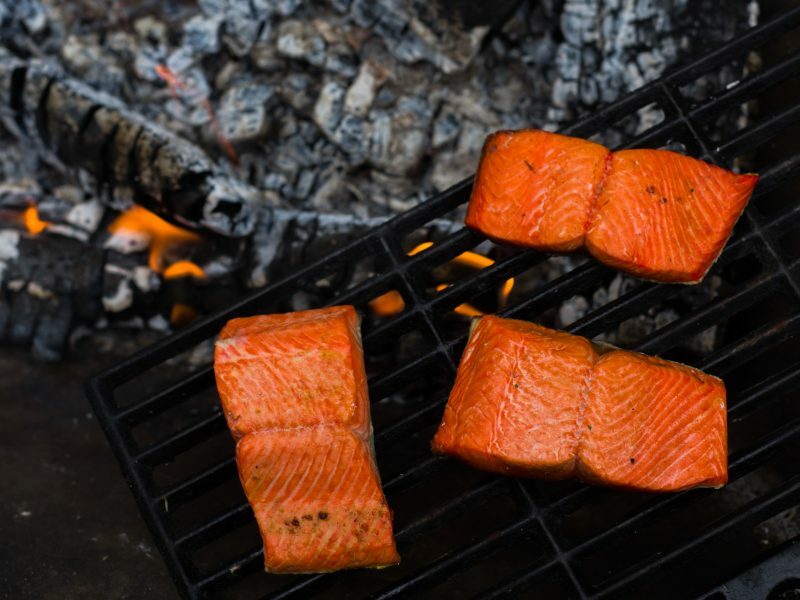 Cooking with cedar planks might sound intimidating, but they’re probably the easiest way to grill up an incredible meal, imparting smoky, aromatic flavors into your fillets of salmon, no flipping required. A set of food-safe cedar planks will cost you about the same price as grilling racks, but they are single-use items so you may want to save those for when you’re feeling extra fancy at the grill. You can keep your salmon basic with salt and freshly cracked black pepper and get grilling over medium heat until it’s as done as you like. Or, with a simple rub or marinade, elevate your grilled fillets of salmon to the next level of delicious; many marinades and rubs come together in a matter of minutes and are a cinch to use when you’re cooking large quantities of food. Pro tip: Using kosher salt in any of these preparations can help prevent your salmon from sticking to the grill without the risk of overseasoning the fish. After you’ve gotten your fish seasoned and flavored up, the most important thing you can do to prep your salmon fillets is to pat them dry. Skipping this step prevents your salmon fillet from developing a nice, golden exterior as excess moisture will get in the way of a proper sear. This is a step you should not skip even if you’re using a wet marinade; don’t worry over whether you’re pulling tasty marinade away from the fish, since the interior of a properly marinated fillet will be infused with flavor. Portioned salmon fillets are a grill master's best friend. For one thing, having portioned fillets for your cookout takes the guesswork out of how much salmon you’ll need to feed your guests. You won’t have to fumble over the math on how many ounces you need per person or fret over whether you’re going to run out of food before you serve your last guest. Twelve guests? Twelve fillets, and maybe a few extra in case a few people are craving seconds. Portioned fillets also give you more flexibility than would a whole side of salmon, as you don’t need to cook everything up at once; you can grill fillets to order for latecomers if you want that option (though grilled salmon is delicious at backyard temperature). Anyway, flipping an entire side of salmon on the grill is no easy feat. Fillets are going to make flipping the salmon infinitely easier. Wild salmon fillets won’t need more than five minutes on the grill — about two to three minutes per side. After pulling your fillets from the heat, you’ll want to allow them to rest for about 10 to 15 minutes. This happens to be plenty of time to grill up some hot side dishes that you’ve prepped ahead of time. Quickly clean off your grill rack with a wire brush or scraper. You should be able to grill up two or three rounds of summer veggies while the salmon is resting: think olive oil brushed over slices of zucchini, summer squash, and beefsteak tomatoes, all of which can be served on their own after five minutes on the grill or tossed afterward with crumbled goat cheese or feta and a splash of balsamic vinegar. Shishito peppers are another no-fuss side dish that can go onto the grill after you pull the salmon. Before the cookout, pre-load a grill basket or two with oiled and seasoned peppers or have a grill pan ready to go (shishitos will fall through the grill rack if you’re putting them on directly). Turn up the heat to high as soon as the salmon fillets are all off the grill and wait five or ten minutes for things to heat up; if using a grill pan, preheat the pan on the grill during this time. When your grill is super hot, the shishitos go on for about five or six minutes until they are blistered and scorched. Serve immediately with an extra sprinkling of sea salt. Corn on the cob is a cookout staple and should only take about 15 minutes if you’re cooking it directly over hot coals or near a gas flame. Wrap shucked corn in heavy duty foil with a pad of herbed butter for the easiest side ever: you won’t need to bother with cleaning the grill before throwing on the corn, and the corn will stay hot for long after it’s come off fire.